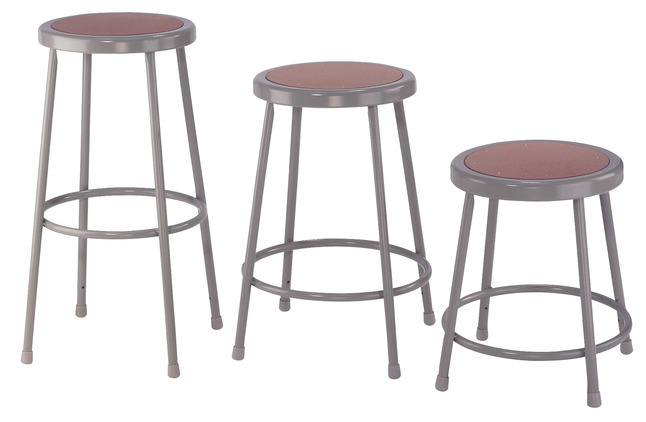 National Public Seating 6200 Series stools are great for science labs and industrial areas. Stool is made from quality steel with an enameled surface. Tubed legs have an outside diameter of 7/8 inch and are made from 18-gauge steel tubing. The bottom of each leg has non-marring polypropylene glides. Seat is 14 inches in diameter and has an 11-1/2 inch diameter recessed Masonite board riveted into the pan and will not chip or crack. The 5/8 inch outside diameter foot ring is welded into each leg by 4 contact points at each leg for added rigidity. Assembly required. Certified Green and includes a 10 year warranty.